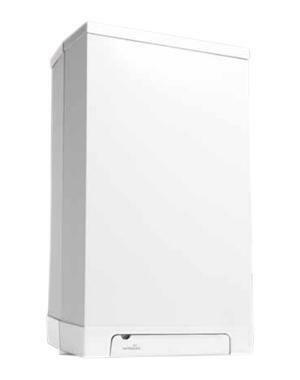 The Rapid 32kW Plus Combi combi gas boiler is a compact condensing unit that has been designed and manufactured by Intergas. Thanks to being compact in size and wall mounted, the Rapid Plus will help you to save space around the home. Intergas have manufactured a highly efficient unit that comes with a 94% efficiency rating and an ErP A rating for heating and hot water. With an output of 32kW, this is perfectly suited to larger homes with more than 1 bathroom and a higher demand for heating and hot water. The range also includes a boiler with an output of 25kW which is more suited to medium-sized homes. This highly reliable unit houses many features including a unique back-to-back heat exchanger that reduces heat loss and delivers the optimum heat transfer, a high efficiency pump, a built-in digital clock, a flow rate of up to 13.2 litres a minute, a central flue with flue lengths of up to 13m and only 4 moving parts. It features a built in expansion vessel a fixing bracket, mirrored sight glass and is available as an LPG or natural gas boiler. The Rapid is a 5 in 1 boiler that can be easily converted from a Combi into a System, open vent or multi-point by changing its parameter setting. With this being a Combi, it is a water heater and central heating boiler wrapped into one unit which means that it doesn’t require a hot water cylinder. For this reason the unit is perfect for smaller homes or properties with little space. Featuring a 7 year warranty on the heat exchanger and a 6 year warranty on the parts and labour, you’re well covered long after installation.